Shortly afterwards the Governor of NSW, Sir Walter Davidson, announced he would present a "King’s Shield" to be won by the municipality or shire in New South Wales securing the largest number of fully qualified recruits up to 1 May 1918, the numbers to be determined on a population basis. By early May, 35 Inverell men had been passed by the local medical officer as fit for the second ‘Car’s Thousand’. In total 63 Inverell men volunteered during this recruiting campaign. Finally, it was announced that Inverell Municipal Council, with a proportion of twelve recruits per thousand of the population of the municipality, was the winner of the Governor’s Shield. During a visit to Inverell on 23 February, 1921 His Excellency The Governor of NSW, Sir Walter Davidson presented his beautiful silver shield mounted on oak, to the Mayor Mr S.J.S. Butler. 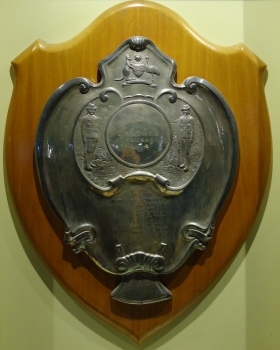 The Governor's shield, sometimes referred to as the Carmichael Shield, is now proudly displayed at the Inverell RSM Club.